Start off your visit on the 15th (Thu): examine the collection at Mildura Holden Motor Museum and then sample the fine beverages at Fossey's Ginporium and Distillery. For more things to do, reviews, where to stay, and more tourist information, read our Mildura online road trip planner . Wodonga to Mildura is an approximately 5.5-hour flight. You can also drive. Traveling from Wodonga in August, you will find days in Mildura are somewhat warmer (20°C), and nights are about the same (5°C). You will have some time to spend on the 16th (Fri) before leaving for Port Augusta. Start off your visit on the 16th (Fri): admire the natural beauty at Australian Arid Lands Botanic Garden, get great views at Matthew Flinders Red Cliff Lookout, and then take some stellar pictures from Water Tower Lookout. To see maps, ratings, more things to do, and other tourist information, read Port Augusta trip itinerary builder app . Traveling by car from Mildura to Port Augusta takes 6 hours. Alternatively, you can fly. Expect a daytime high around 20°C in August, and nighttime lows around 6°C. On the 17th (Sat), you'll have the morning to explore before heading off to Coober Pedy. On the 17th (Sat), examine the collection at Old Timers Mine, then admire the landmark architecture of Faye's Underground Home, and then get engrossed in the history at Umoona Opal Mine & Museum. On the 18th (Sun), you'll have a packed day of sightseeing: take in the architecture and atmosphere at Serbian Orthodox Church, then look for all kinds of wild species at Breakaways Conservation Park, and then look for all kinds of wild species at Josephine's Gallery & Kangaroo Orphanage. Use Inspirock's suggestions to plan your Coober Pedy trip and find the best activities and attractions for your vacation. Explore your travel options from Port Augusta to Coober Pedy with the Route module. In August, daily temperatures in Coober Pedy can reach 23°C, while at night they dip to 8°C. You'll have a few hours on the 19th (Mon) to wrap things up before traveling to Uluru-Kata Tjuta National Park. Uluru-Kata Tjuta National Park is known for nature, museums, outdoors, trails, and classes. Your plan includes some of its best attractions: appreciate the views at Valley of the Winds, take in the dramatic natural features at Uluru, head outdoors with Walpa Gorge, and take your sightseeing to a higher altitude at Kata Tjuta. To see other places to visit, more things to do, and tourist information, go to the Uluru-Kata Tjuta National Park trip itinerary maker app . Drive from Coober Pedy to Uluru-Kata Tjuta National Park in 8 hours. Alternatively, you can fly. When traveling from Coober Pedy in August, plan for a bit warmer days in Uluru-Kata Tjuta National Park, with highs around 27°C, while nights are about the same with lows around 6°C. On the 22nd (Thu), you'll have the morning to explore before heading off to Coober Pedy. On the 22nd (Thu), admire all the interesting features of Tom's Working Opal Mine and then pause for some serene contemplation at Catacomb Church. To see other places to visit, maps, more things to do, and other tourist information, you can read our Coober Pedy holiday planner . Getting from Uluru-Kata Tjuta National Park to Coober Pedy by car takes about 8 hours. Other options: fly. 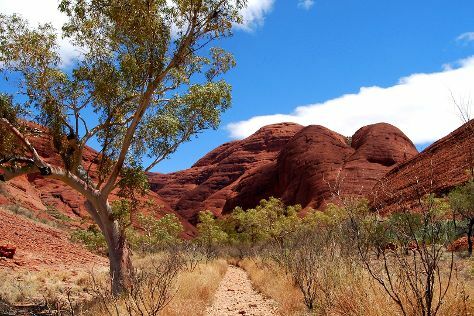 Expect slightly colder weather when traveling from Uluru-Kata Tjuta National Park in August: highs in Coober Pedy hover around 23°C, while lows dip to 8°C. You will have some time to spend on the 23rd (Fri) before leaving for Port Pirie. Port Pirie is the sixth most populous city in South Australia after Adelaide, Mount Gambier, Whyalla, Murray Bridge and Port Lincoln. Kick off your visit on the 23rd (Fri): view the masterpieces at Port Pirie Regional Tourism & Arts Centre and then see the interesting displays at Port Pirie RSL Museum. Plan a trip to Port Pirie easily and quickly by telling Inspirock to suggest an itinerary. Traveling by car from Coober Pedy to Port Pirie takes 6.5 hours. Alternatively, you can fly. August in Port Pirie sees daily highs of 20°C and lows of 6°C at night. You'll have a few hours on the 24th (Sat) to wrap things up before traveling to Robinvale. Robinvale is a town on the south bank of the Murray River in north western Victoria, Australia. Kick off your visit on the 24th (Sat): stop by Robinvale Organic & Bio-Dynamic Wines. To find more things to do, other places to visit, and more tourist information, read Robinvale travel route tool . Traveling by car from Port Pirie to Robinvale takes 6 hours. Alternatively, you can fly. In August, plan for daily highs up to 20°C, and evening lows to 5°C. You will have some time to spend on the 25th (Sun) before leaving for home.